Mock Objects, 2016, installation view (detail). The Testing, Testing symposium was staged to open a discussion about the potential for interdisciplinary dialogue that can be generated by practical art research. My Ph.D. is concerned with attention and distraction in the context of compulsive internet and device usage, and so references the strongly interdisciplinary field of critical attention studies.1 It also involves study into areas such as user interface and user experience design; human computer interaction; behavioural addiction; as well as media studies, sociology and cultural studies. The symposium offered an opportunity to see a range of perspectives on an approach that is central to my research. The spectrum of disciplines that my research interacts with has required me to think carefully about how to plan my study, as it would be impossible to reach a doctoral level of expertise in all of these seemingly unrelated areas. In my symposium presentation, I compared artistic and scientific research using an analogy with oil prospecting. The generation of knowledge through scientific research can be thought of as analogous to drilling for oil. First, a survey is done to identify likely locations where oil might be found (literature review); an apparatus, such an oil platform, is constructed to drill for oil (hypothesis), and if the location and apparatus are right, oil is found (new knowledge). The practice of ‘drilling down’, or gradually focusing in on an area of knowledge, also provides a way of conceptualising how knowledge is generated through scientific research. By comparison, artistic research is more like cleaning up an oil spill. After an oil spill, the leakage is corralled and scooped up by ships over a wide area of the surface of the sea. This resembles the way in which artistic research gathers material from wide-ranging and disparate sources, as if ‘leaked’ from other disciplines, and generates new knowledge by using new aggregations of this material as a context for the production of artwork. While this isn’t a perfect analogy and has plenty of inconsistencies — how are ‘knowledge leaks’ identified and located, for example? — it has proved a useful way to begin to consider the way that interdisciplinarity operates in my study. The starting points for Mock Objects, my piece in the exhibition, are drawn from a number of disciplinary perspectives. In my contribution to the previous volume, I wrote about gamification and the permeability of the border between online and offline experience that informed the production of the piece. Here, I want to look at the insights that the exhibition process has generated, and how they might feed back into my research enquiry. The piece consists of augmented reality software that I have modified to highlight certain of its characteristics. The software operates by locating geometric markers in a video frame and then calculating their orientation in 3D space, in order to then insert virtual augmentations into the video scene.² The software analyses a frame of video and calculates two alternative best guesses for the orientation of the marker, which are represented as two planes in 3D space. For each plane, the software gives a numerical estimate of the amount of error in its calculation. Since this process is repeated on every frame of video, the orientation of the planes changes from frame to frame, resulting in a flickering, restless image that reflects the uncertainty of the software’s algorithms. 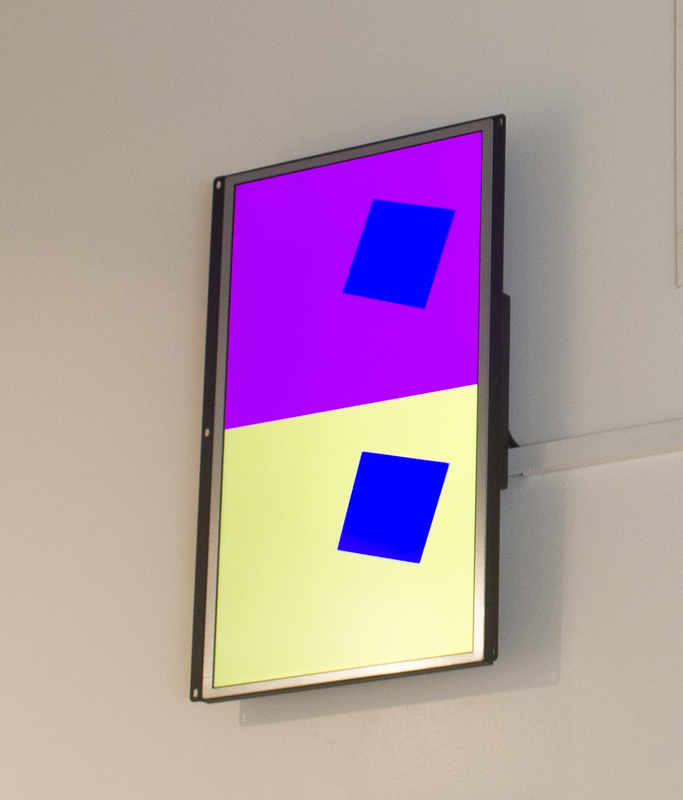 The piece was shown on an unframed monitor and installed high on the wall of the upper space at SIA Gallery. The wall chosen is perhaps the least compelling wall in the gallery for the exhibition of artwork, since as well as being physically behind the viewer as they enter the gallery, it is also the site of a large air vent, several metres of cable trunking, the security alarm’s passive infra-red sensor and control console, and the entrance door to the space. This visual clutter is supposed to be ignored by the viewer as they go about the business of attending to the artwork. While positioning Mock Objects on this wall was an instinctive decision in response to curatorial constraints, doing so placed the work at a nexus of the play of attention involved in gallery attendance. Most of the visual clutter on the wall can be considered to be infrastructural: it supplies lighting, air or electricity, supports the security of the artworks, or provides physical access to the space. As John Durham Peters has written, ‘the bigger the infrastructure, the more likely it is to drift out of awareness’. He goes on to suggest that since the prefix infra means below, the presence of infrastructure should prompt the question of what it is intended to be infra to.3 In this case, by its retreat into the background, the ‘invisible’ infrastructure foregrounds the white-walled institutional gallery space, with its established structures of engagement, expectations of behaviour and attentional norms. The siting of the piece allows the work to oscillate between its status as a focus for the viewer’s attention and as potentially ignorable infrastructure. The piece’s onscreen image further complicates matters. The flickering planes invite the viewer to make a comparison between their two possible orientations. The viewer here is installed as an empowered overseer, and is given the opportunity to apply conscious scrutiny to the output of a visual processing algorithm. This contrasts with the power relations enacted by user interfaces that invite compulsive usage, in which design tricks are often used to invoke unthinking, habitual interactions. The colour and orientation of the planes is unmodified from their appearance in the debugging view of the original software, but the background has been changed from a static colour to a slowly shifting cycle of colour. This allows attention and distraction to alternate between the visual elements within the work. If the viewer is focusing on the movement of the planes, they might not notice the background changing until after the change has taken place. The piece was produced with questions about compulsive usage in mind, but it has prompted additional questions about the veracity of computational representations of reality as enacted by software in a broader sense. If even simple algorithms like this one are prone to error, why are computerised outputs so often deferred to in other situations? In this piece, the algorithm’s uncertainty is presented as a binary choice — this plane or that plane — but computerised modelling of reality is often much more sophisticated than this, and the consequences more significant. For example, when using social media, multiple data points are passively generated and gathered to produce profiles of the user which are then used to push precisely targeted, attention-capturing advertising. Facebook identifies almost a hundred separate data points to categorise users based on the data they generate through their use of the service.5 Algorithms model the viewer, and shape the view of reality that they are then presented with. These interpretations of the work and the questions they raise might not be straightforward for a casual viewer to access. While a viewer might read the work only on its visual appearance, having the dual perspective of both viewer and author has enhanced my analysis. With prior knowledge that the piece is made of modified software, and knowing the extent of the modification and its functioning, questions about algorithmic interpretations of reality present themselves more readily. Conversely, by reading the image solely on its appearance, a viewer might come up with a very different set of interpretations and questions.6 Exhibiting the work in a gallery context has revealed that the meaning and the research content of this particular work are best uncovered not by asking what it looks like, but by asking how it works. This raises a further question, one that was hinted at above: if the white-walled institutional gallery is a highly structured context in which visual appearance is the first point of encounter with an artwork, is staging work in this context the best way of exploring computational questions? Are there other ways of understanding the work, or more viable contexts for its presentation? A parallel but relevant set of ideas can be found in Louise Amoore’s work on the geopolitical consequences of cloud computing.7 Writing about Trevor Paglen’s work, which consists of photographs of National Security Agency data centres taken with astronomical telescopes from great distances, Amoore locates such artistic approaches ‘within and alongside the paradigm of observation’.8 She argues that observation alone is an inadequate way of understanding the computational cloud, partly because so much algorithmic processing takes place at speeds that are beyond the human capacity to observe. She instead proposes a distinction between mimetic and analytical scientific instruments, and argues that the observable physical characteristics of the cloud, such as its territorial location or the buildings used to house it, are less important than the cloud’s capacity to analyse and extract patterns from data. Following this reasoning helps develop a more nuanced understanding of Mock Objects. The piece asks to be attended to as art, invoking the established forms of attention that the gallery context demands, even though these are problematized by the work’s location alongside ‘invisible’ infrastructure and by the behaviour of the onscreen image. Since the gallery context favours the observable characteristics of an algorithmic system over its analytical capacities, the power dialogues inherent in data modelling remain obscured: infra to the the display of work and difficult for the viewer to access. As a research activity, ‘exhibition-as-method’ has therefore framed a new set of questions to do with exhibition context and the accessibility of meaning that can be explored in future work. 1 See Rogers (2014) for a thorough review of the field. 2 The AR library I used is called js-aruco, and has been developed by Juan Mellado. 3 See Peters (2015), p. 36. 4 See Nelson (2013), p. 28. 5 Caitlin Dewey, ‘98 Personal Data Points That Facebook Uses to Target Ads to You’, The Washington Post, 19 August 2016 <https://www.washingtonpost.com/news/the-intersect/wp/2016/08/19/98personal-data-points-that-facebook-uses-to-target-ads-to-you/?hpid=hp_hp-more-top-stories-2_intersect-701am%3Ahomepage%2Fstory> [accessed 21 August 2016]. 6 One symposium attendee described the work as ‘almost Greenbergian’, noting its visual similarity to twentieth century abstract painting. 7 Louise Amoore, ‘Cloud Geographies Computing, Data, Sovereignty’, Progress in Human Geography, 2016, 309132516662147 <http://doi.org/10.1177/0309132516662147>. Nelson, Robin, Practice as Research in the Arts: Principles, Protocols, Pedagogies, Resistances (Houndmills, Basingstoke, Hampshire: Palgrave Macmillan, 2013). Peters, John Durham, The Marvelous Clouds: Toward a Philosophy of Elemental Media (United States: University of Chicago Press, 2015). Rogers, Kenneth,The Attention Complex: Media, Archeology, Method (Basingstoke: Palgrave Macmillan, 2014). Michael Day is an artist and researcher based in Sheffield. His art practice is focused on digital technologies and the potential implications of their increasing entanglement with all aspects of contemporary experience. He has exhibited and screened work in venues across the UK and internationally, including the recent exhibitions Possession at Bangkok Cultural and Arts Centre (2013), Deadpan Exchange VIII at Casa Maauad, Mexico City (2014), and Sluice__2015 at Oxo Tower Wharf, London (2015). He has participated in the digital art festivals FutureEverything in Manchester (2010) and Piksel in Bergen (2009), and has undertaken residencies with Hull Time-based Arts (2005) and PVA Medialab (2009) in the UK, and with Lademoen Kunstnerverksteder (2011) in Trondheim, Norway. He is a senior lecturer in fine art at Staffordshire University. His Ph.D. research is concerned with experiences of distractibility that are said to have emerged alongside the recent widespread adoption of digital communications technologies. Should compulsive engagement with digital media best be seen as ‘information overload’, or as a desirable retreat into enjoyable technological distraction? How might the way digital systems are understood—as data streams or cloud processes—impact on the way we attend to them, or how they algorithmically attend to us?